So I have been really debating about writing this post. Why? Because I don't want to hurt other people and I don't want to hurt their businesses. BUT upon learning about this I felt it needed to be shared. But first a little back story. If you are a regular reader to my blog you know I love Direct Sales. I don't do them, but I love to support women who have the hustle to do them, because direct sales are HARD. I have been a part of three MLM companies before. I learned a lot about Multi Level Marketing and there are companies that have left a bad taste in my mouth. One reason is that their products are usually pretty sub par for a high end price. There is (in my experience) usually a handful of products that work well and are worth your time and money, and the rest are kind of awful, but are peddled as incredible by their reps. My experience with Tyra Beauty was the worst. I feel that the reps we were lied to consistently, from day one. Even Tyra's motivation for starting the direct sales line of the company was exposed. I felt hurt and also frustrated, because she was an idol of mine and I was seriously upset that she was not who she professed to be. But the number one thing I hated about Tyra Beauty was that we were always in competition with the company itself. If you go the Mary Kay website and try to order products it will direct you to find a consultant. You literally can't purchase these products without choosing a consultant, this is typical of direct sales companies. But that was never the case with Tyra Beauty. You could buy directly from the company and they said a portion of that money was redistributed as a bonus for the higher ranking reps. But only a portion. And with a rep making only 20% I am unsure why they thought it was necessary to do this to get us bonuses. Oh, because it's not. Anyways the whole company was a mess and they closed their direct sales line before they hit their 3 year mark. Regardless I find it super dishonorable when a direct sales company is in direct competition with their representatives. So back to Color Street. What does this have to do with them? You can't buy Color Street direct from the site without a rep (if you do, they send the commision to the rep closest to you) and you've never seen Color Street on store shelves. Or have you? I love Color Street. It's easy and long lasting and cute. I do my nails with their products all the time. You can read my full review about them here. I liked this company and even considered joining because they are just one dynamite product, and don't have a bunch of crappy items I'd feel a lot pressure to sell. Then my sister came to me and told me she has seen a lot of competitors pop up, that were also 100% nail polish strips. I thought that to be odd because Color Street is supposed to hold the patent for these kinds of strips. But while I was at Ulta I saw the Incoco polish strips and picked them up to compare. That is what I do on this blog after all. But something struck me as odd right away. The strips are packaged similarly. 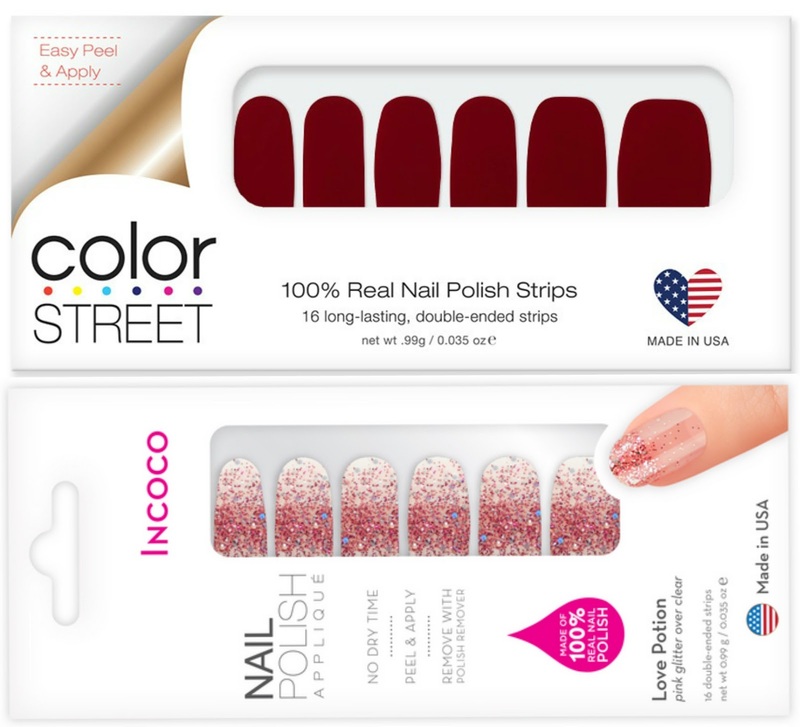 Both Color Street and Incoco nail strips also come with the same files and little nail prep pads that have almost identical packaging. All I had to do was go to Incoco.com to learn the truth. Not only are these two products the exact same formula and technology, but there is even a THIRD line. 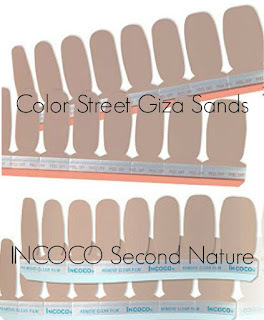 Incoco (the parent company) has Color Street, which admittedly has the largest selection of the three. Then they have a second line, Incoco (their namesake). Incoco is a less expensive option with different patterns and designs. With color street costing a steep $13.00 for their designs and $11.00 for their solids, and Incoco is $7.99 for their designs and only $5.99 for their solids. These can be found in stores like Ulta. But that's not all. They have a third Budget Option that sells at Walmart called Coconut. Coconut appears to have the smallest range and only has patterned designs, no solids, ringing in at $4.95. While they don't have repeating designs, some of the solid shades are exact matches. 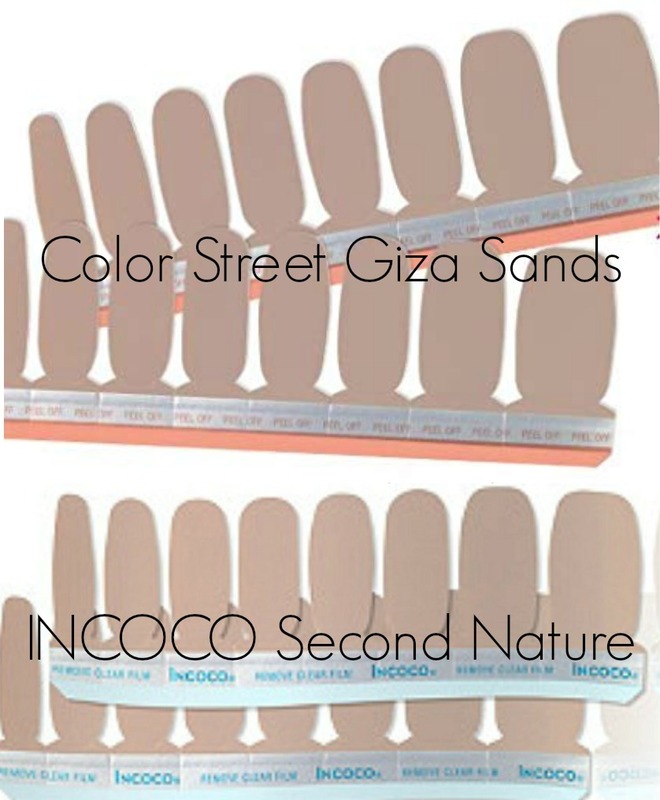 Take for example the picture on the right which is Giza Sands from Color Street on top of the solid shade Second Nature from Incoco. When it comes to patterns, I haven't found any that exact, but many that VERY similar. 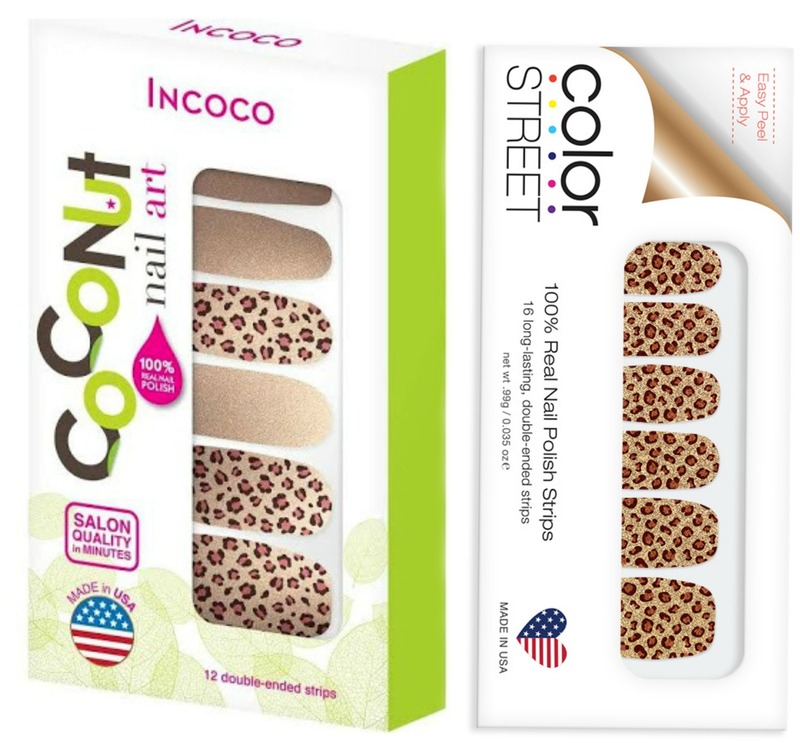 Check out this comparison of Coconut's Steal the Show next to Color Street's Safari Chic below. If you like Safari Chic you can snag it at Walmart for less than half the price AND without paying for shipping. So here is the deal - if you love color street, I still recommend you buy from your friends who you'd love to support. But I'd be lying if I said I am not going to start snagging Second Nature instead of Giza Sands (my go-to right now) because it's cheaper, more accessible, and doesn't require me to pay shipping. If you've been wanting to try it but can't spend the money go to Walmart and grab some Coconut ones. Plus they all have different patterns. There are some patterns in Incoco you can't get in Color Street that are SUPER cute. As for becoming a rep, I was honestly considering it with Color Street. I have a lot of friends who sell it and I love the product. Unlike other companies, this one only needed one dynamite thing, because they only sell one thing. I thought this could be it for me, but I was wrong. I am so bummed that the company competes against it's own reps like this. I am so bummed to learn this about ColorStreet. I love their products. I’ll have to venture out to get a set of these others and see if there is any difference myself. It’s very sad that a company would do this. Incoco & coconut and color street are all the same, sister companies , they belong to Fa Park the man who holds the patent to nail strips. It’s like having a good(coconut) better (incoco) Best (Color Street). I loved them all I started with incoco and coconut. It just seemed that coconut was more stickerish with no give/le way for mistakes. But the products are almost the same. Their are so many choices with color street! Also since these companies do belong to Fa Park the amount sold in stores will be less and less because he is doing so well with the MLM. So they will be weeded out by the end of the year. Grab what you can...you will be able to feel the difference. THEY ARE SUPER FUN AND AFFORDABLE EITHER WAY! I have heard that he is saying he will be phasing out Incoco and Coconut, but I will believe it when I see it! If you know a little about business and mark ups, the truth that is sad in this situation is that the consultants and consumers are not being treated fairly at all. Fa Park can clearly make money selling these at $2.50 wholesale to Walmart. This means they cost less than $1.25 to manufacture landed. So why do Color Street consumers have to pay more than double the retail price for the namesake line? Especially when he is selling direct to consumer through reps. Reps don't make 50%, which means Fa Park is making more than the total retail price of his medium priced line, every time one of you sells a set of his high end line. Why? Why don't you make more? Mary Kay starts reps at 50%, seems like he easily could too and would still make more of Color Street than Incoco. And Mary Kay pays for ad space in Vouge and other magazines. I feel it is sad because you all are doing ALL the work to get this company out there, and he is charging consumers a premium price and under paying his consultants. I am a Color Street stylist and love the product. I am not thrilled to learn about the cheaper versions of same product and do hope Mr Park fades them out by years end as it seems like a disservice to us stylists. I also am a rep & i am not too happy. The fact that i am being charged $10 a month for the "stylist website" & only get 25% & still have to pay for shipping & still have to pay FULL PRICE for product! I am gonna cut my losses because im not about scamming people. I am an honest person & have had multiple clients ask if incoco & coconut r the same & i have not lied to them nor will i ever. I am so disappointed because i LOVE the product. I also am a Color Street stylist. Not only do the above comments ring true, Color Street also does not stand behind their over priced product. When a customer has problems with their nails cracking, chipping, not adhering properly and so on the response from Color Street is "Well nothing is perfect" or "apply a top coat" or "apply 2 strips to 1 nail" Customers feel mislead since the advertising makes them seem so perfect. The 7-14 days they are supposed to last is more accurately 7 days, 10 at very best. I am a CS stylist. My everyday job is research. I will definitely put time and research in this news. I am feeling a little duped. I am considering becoming a Color Street stylist and knew about the other lines. In fact I asked the person that was bringing me in and she stated that as the contracts expire in these lines they are no longer renewing them. i.e. Target no longer carries them. (Though I have not been there recently to check.) I am concerned about the lack of customer support if there are issues and will ask her about this. Have any other stylists run into this issue? It is my understanding that Fa Park told his reps he would be fading the other lines out, and then told them that he renewed his contracts and that he will continue selling Incoco. My friend was upset by the deception from their CEO, but he gave a statement saying that Incoco and Coconut have existed and they have had thriving businesses thus far, so it clearly isn't a big deal. That is paraphrased of course, but that is my current understanding. I honestly don't see the big deal that there are other options...Color Street is the best, and that is that. I joined recently and am enjoying myself very much as I am paying off my credit card debt and taking care of my family. It's an amazing family that you can't get from buying your strips at Walmart or Ulta. The issue isn't that their are other options. It is that the company makes almost identical products that they sell for half the price in consumer stores. If I were signing up to sell a brand, It would be impossible for me to convince someone to pay double to buy from me, when they can snag the same item at walmart for less. BUT I am so glad you've loved your experience with Color Street thus far. It definitely isn't typical for a company to compete against it's own res in this capacity.